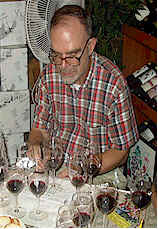 The 1999 vintage had growers and winemakers worried. It was a summer somewhat like its predecessor, 1998. The growing season was cool, causing many to wonder about those reports about global warming. Cabernet Sauvignon, being a late-ripening variety was hanging on the vine when a late September heat spell pushed sugars upward and allowed vintners to harvest ripe and physiologically mature fruit (providing they managed crop levels judiciously). With 1998 being a much-bashed vintage by the wine media, we were curious to see how a representative assemblage of Napa Cabernets would fare with those who count most: consumers. While one person felt we should have disqualified this wine and had everyone pour their sample back into the bottle, I thought it would be interesting to see how many people would recognize this flaw and rank it last. Interestingly only half of the tasters made this flawed sample (no fault of the winemaker, simply a bad cork in the bottle) as their last place wine! Two tasters even had this highly ranked!!! Amazingly the smell of a dank cellar full of wet cardboard is not a "turn off" to some tasters. I wonder how they'd rank the wine had it not been tainted!!! One taster described this as "horsy, herbaceous with earthy currant notes and wild, tart berry overtones and an oaky finish." One woman described it as "hard and astringent with a sour, dill pickle character." Another critic likened this to a "three bean salad," while someone else also keyed on vegetal elements, finding "green olives and canned peas." I think I was more positive in describing the elements here. I found sweet oak with a mild anise-like component to the fragrance. There's a coffee-like tone here, too along with a smoky, hickory quality. I wondered if there was any Cabernet Franc here (it turns out it's 100% Cabernet Sauvignon). On the palate the wine is quite youthful, with rich fruit notes and plenty of tannic structure to suggest this needs cellaring for 5-10+ years. I rated it one-and-a-half stars on my three star scale, zero being a standard or ordinary wine. Quite good. "I found tart cherry fruit and rustic, plum-like notes along with a mineral component and a short, mouth-puckering finish." said one critic. Another taster encountered "burnt rubber tires, with a sulfury note which reminded me more of an old stinky fish tank." A third panel member felt this was "simple, flat...not bad...I liked the interesting green notes and berry fruit." Someone else found a "grassy quality" to this wine. I found some cedary and woodsy qualities on the nose with some black fruits. It's a bit tannic, but should age nicely for a number of years. Given the supposed greatness of the vineyard source, one might have hoped for more. One star rating. This "regular" bottling from Duckhorn was described by one taster as "dark, sleek, rich and chocolatey with plum notes and mocha-laced currants." Someone else criticized it for being "a bit flat on the finish." Another taster found it to be "nicely layered on the palate," while someone questioned whether or not this was a barrel sample since it is "so fruity." One panel member described it as "fleshy, with dark fruit notes and it's silky smooth and almost oily rich." Another person found this to be "fruity and tart but well-balanced." I enjoyed the woodsy notes and currant-like fruit character here. The wine is stylish and medium-full bodied. There is a moderate amount of tannin here, with plenty of red fruit notes on the palate and some cedar elements, too. Very fine. Five to ten years of cellaring potential. One-and-a-half stars. The first critic found "fresh basil aromas with mint, tapenade and green olive notes...some green bean and herbal qualities here with a fair bit of astringency, but not sour." One person found this to be sharp, saying "it's almost vinegary, earthy with tart, dried berry notes and some green bean-like qualities." Another taster found it to be "under-ripe, but well-made." A couple of other tasters detected "high alcohol" in this wine. I found the fragrance here to be quite interesting, with coffee notes and sweet cedar. I found more black fruit fragrances, so my descriptors are quite different from those finding more vegetal notes. My only criticism of this wine is that it seemed a bit shallow on the palate compared to the other wines in this tasting. It's elegant and refined...quite good and approachable now, in my view. One star+. One taster felt this wine "started out disjointed, but after 20 minutes it came together." Another person found "rich black cherry notes, blackberry, mocha and dusty characters with chocolate-laced berries." Someone else found "ripe and plummy notes with ripe, juicy dark berry fruit." A more critical view was sounded by another taster who asked if this isn't a "dead wine? It's dumb with virtually nothing on the palate aside from the tannins. Very shallow." Someone else described this as "fat, full and low in acidity." 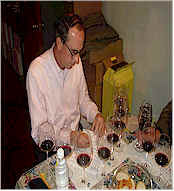 I found the aromas to show nice oak, very cedary on the nose with deep Cabernet fragrances. It's rather full on the palate and is big, rich and massive. The fruit shows elements of ripe plums and blackberries with some oak underneath. It's fairly tannic, so patience is required. One-and-a-half stars. "I liked this," said one person, "It's an oak bomb with smoke, bacon notes and some blueberry fruit on the nose. It's too oaky on the palate, though." Another critic found "bright blackberry fruit and some forest floor notes. It's fruity and silky-textured on the palate." Someone else found "vanilla-laced cherry and berry notes with roasted herbs and a toasty oak finish." 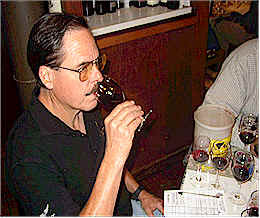 Another participant found "black fruits," while someone else found "dusty tannins." This is a really nice Cabernet! I found classic cassis fruit and cedary/dusty fragrances. It's rather rich on the palate, having a full follow-through with lots of black fruit flavors. Two stars+. 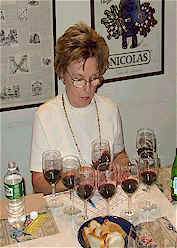 1st Place: TURNBULL 1999 Napa "RED WINE"
"Wow!!! I loved this," said one taster. Another found this to be "Zinfandel-like with unripened blackberry fruit, cola and plums and currants on the finish." Someone else found "cherry cola" notes with one taster felt it's got a "bitter finish and is more astringent than most of the other wines." Other tasters commented on the wine's intensity, one person finding this to be "very hot." Another found it "heavy," while one wag said "it's too low in alcohol and sugar to serve as a dessert wine." I found the fragrance to remind me a bit of soy sauce. There's a nice bit of wood here, showing cedar and vanillin notes. There's a lovely minty streak to the flavors, with a fair bit of tannin and plenty of richness. Two stars.